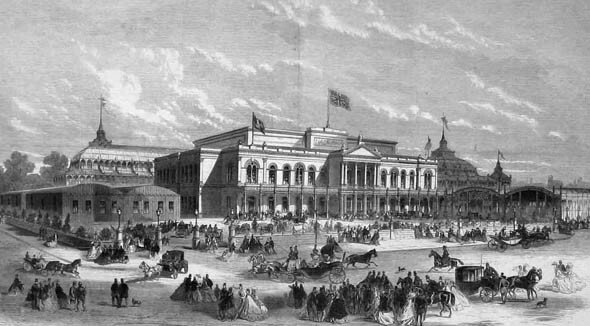 The former Coburg Gardens (now Iveagh Gardens) hosted the Dublin International Exhibition of 1865 and a further exhibition in 1874. After the exhibitions, the building were converted to examination halls for the Royal University of Ireland, which was created in 1880. And later became the central building of University College Dublin. These were then later redeveloped in 1914 by the architect Rudolph Maximilian Butler. Butler’s buildings have since been redeveloped to contain the National Concert Hall. The campanile to the right of the photo was removed to the rear of Government Building at Merrion Street and later demolished with the constructed of Agriculture House on Kildare Street.